The Ross Evolution LT Reel is unquestionably one of the lightest fly reels ever produced. This large arbor fly reel is a machining masterpiece and the lightest in its class. The Evolution LT is fitted with an aluminum spool cap, aluminum drag knob and aluminum escapement cover. 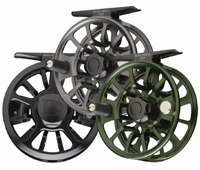 To keep the weight in check with these improvements, ventilation has been added to the spool and the frame, allowing for the addition of metal components with no measurable weight increase.